Not many people have a cloud-making machine in their labs, but Sarah Brooks does. And it demonstrated the role pollen plays in cloud creation. Dr. Brooks working in her lab. The main job of pollen is to help seed the next generation of trees and plants, but a new study from the University of Michigan and Texas A&M University shows that the grains might also seed clouds. The unexpected findings demonstrate that these wind-carried capsules of genetic material might have an effect on the planet’s climate, and they highlight a new link between plants and the atmosphere. The team’s work is in the current issue of Geophysical Research Letters, and the project is supported by the National Science Foundation. Pollen has been largely ignored by atmospheric scientists who study aerosols – particles suspended in the air that scatter light and heat and play a role in cloud formation. But Steiner and her colleagues weren’t sure that was the whole story. Sweeping a dusting off her porch one spring morning, she wondered what happens to the grains in the air. Steiner turned to the medical community. Pollen causes seasonal allergies, which affect between 10- and 20 percent of U.S. residents. “When we were looking in the allergy literature we discovered that it’s pretty well known by epidemiologists that pollen can break up into these tiny pieces and trigger an allergic response,” Steiner said. “What we found is when pollen gets wet, it can rupture very easily in seconds or minutes and make lot of smaller particles that can act as cloud condensation nuclei, or collectors for water,” Steiner said. They used an atomizer to produce a spray of the moist pollen fragments. 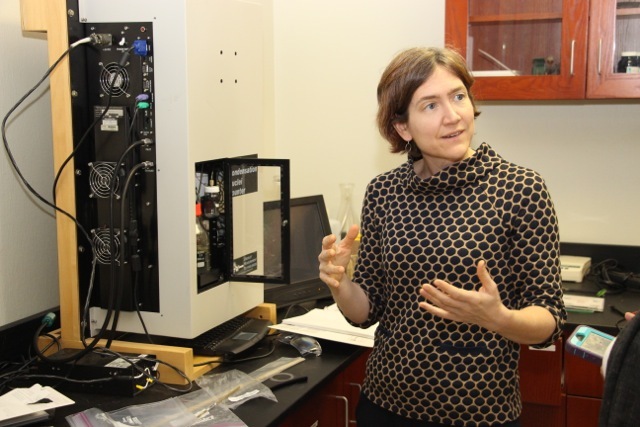 The pollen fragments were sent into a cloud chamber in Sarah Brooks’ laboratory at Texas A&M. The team found that three different sizes – 50, 100 and 200 nanometers – of all six types began to pull in moisture and form clouds. Samples entering the cloud chamber are exposed to moist conditions representative of the relative humidity found in the atmosphere. If a sample is an effective cloud activator, droplets will rapidly grow on the sample fragments, forming large cloud droplets. Cloud droplets are 10 times larger than the pollen fragments. Cloud droplets are counted at the exit of the cloud chamber by an optical particle counter. For confirmation, they looked at the samples under a scanning electron microscope, and they saw that grains that had begun as10-20 micrometer diameter had ruptured, releasing many fragments of 100 nanometer or greater diameter in size, well within the size that can lead to cloud formation. The findings could impact climate science and public health. And the allergy community might be interested in knowing what the particles are made of. When the particles ruptured, the researchers determined that they’re mostly carbohydrate and protein. As next steps, the researchers plan to conduct similar studies in the field and, through computer simulations, model the potential feedback between the plant life and the atmosphere. “It’s possible that when trees emit pollen, that makes clouds, which in turn makes rain and that feeds back into the trees and can influence the whole growth cycle of the plant,” Steiner noted. 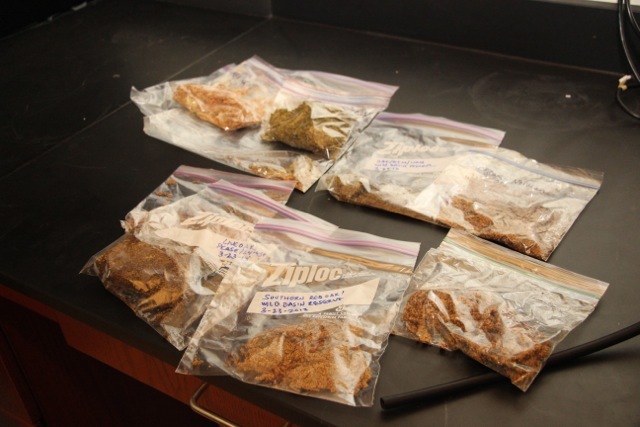 Bags of pollen were collected from Texas and Michigan in order to test the hypothesis.